Christmas ornaments are one of my favorite souvenirs to buy on almost every Walt Disney World vacation. 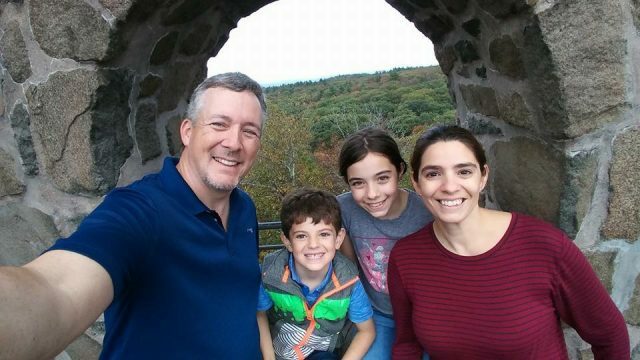 I love taking them out each year, remembering all the magical times I had with my family. They become memories on branches, creating a festive Christmas-themed vacation scrapbook. Besides Disney ornaments. our tree also holds personalized ornaments. Each year we purchase ornaments for the kids. The one they choose usually corresponds to whatever they’re into that year. It’s funny to see how their tastes and personalities change over the years. This project combines our love of Disney and personalized ornaments. 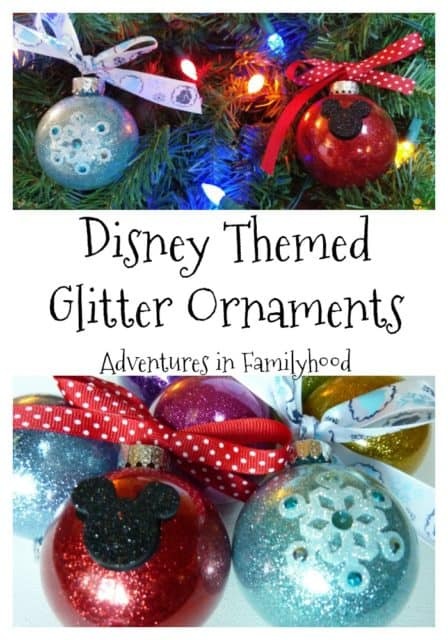 By creating these Disney-themed Glitter ornaments, you can add a personal Disney-themed touch to your holiday. 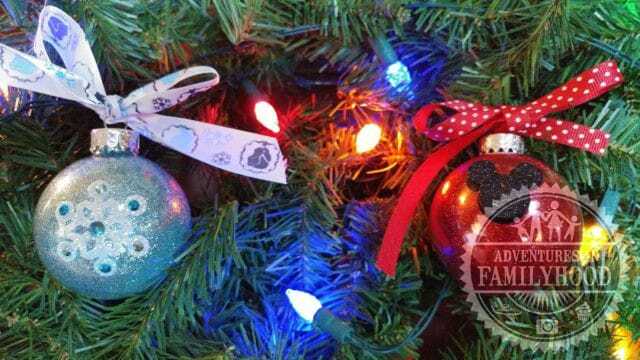 With only a handful of materials, you can create shimmering and sparkling ornaments that are inspired by your favorite Disney characters. I have to admit, I was intimidated by this project at first. The list of materials made me feel overwhelmed. When it comes to crafts, I don’t have a lot of patience for intricate time consuming projects. I really wanted to try it so I had to just do it. This project really surprised me! It wasn’t as hard as I thought. Once I did the first ornament, the rest were easy-peasy. Bella even got in on the act and made some herself. This is a great project for parents and kids to do together. Start by removing the top of the glass ornament. 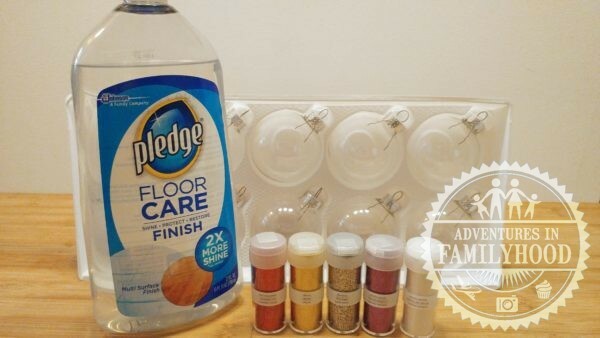 Pour about a tablespoon of the floor finish into the ornament. 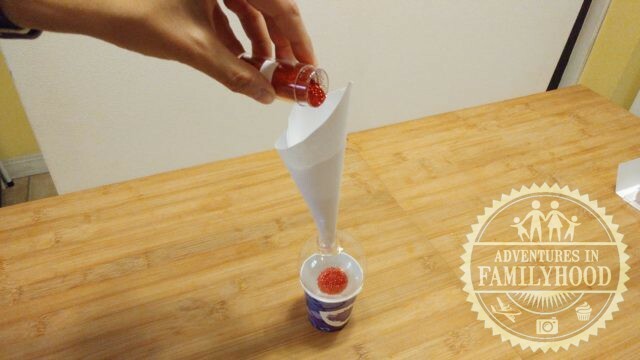 You can either use the funnel or a paper cup. Gently swirl the liquid inside the ornament making sure it has covered the entire inside. 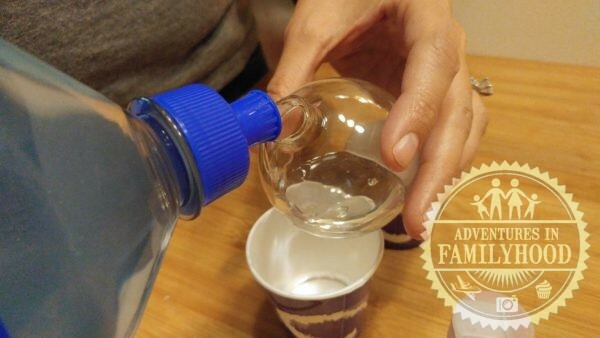 Be careful not to agitate the liquid too much or you will create bubbles. If that happens, pour the liquid out, add a little more and swirl around until all the bubbles are removed. Once the entire surface is covered, pour out the liquid into a cup. Save it for the next ornament you make or discard. Allow the ornament to rest upside down to ensure all the liquid is removed. Next, place the funnel inside the ornament. Pour 2-3 teaspoons of fine glitter into the ornament. Cover the top with a small piece of paper towel and your finger. Gently shake the glitter around the ornament until the entire inside surface is covered. Add more glitter if necessary. Pour out any excess glitter into an empty cup or back into the glitter container. Allow the ornament to dry for a bit before putting the top back on. Tie an appropriate themed ribbon through the top of the ornament. Decorate the surface of the ornament with either vinyl cut-outs or scrapbook embellishments. 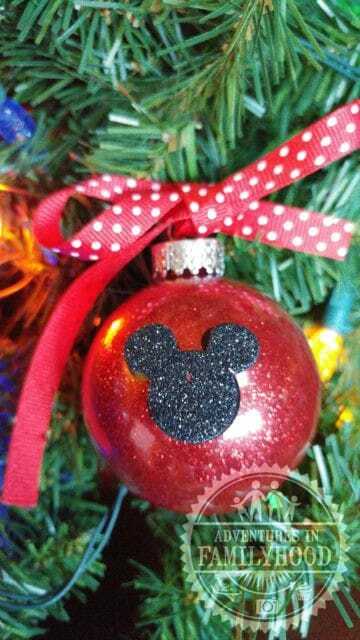 For the Mickey-themed ornament, I used red glitter, black Mickey head scrapbook stickers and red polka dot ribbon. 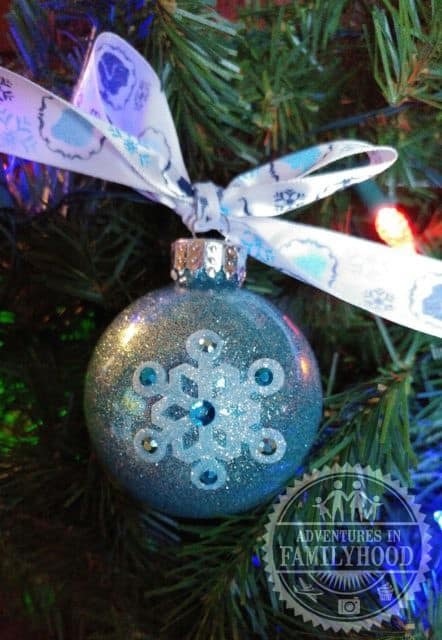 For the Frozen-themed ornament, I used blue topaz glitter, snowflake scrapbook stickers and Frozen-themed ribbon. These ornaments are the perfect addition to any Disney lovers Christmas tree. 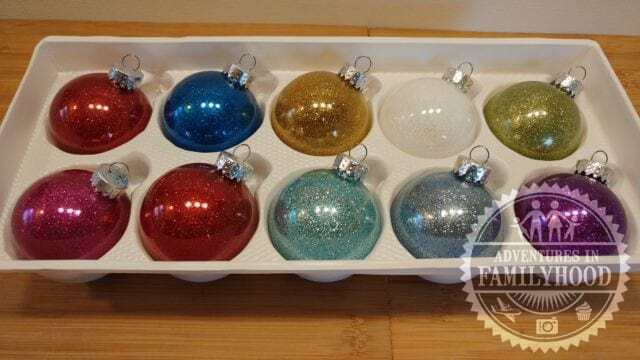 They’re inexpensive, easy and full of Christmas cheer!